Dubai, United Arab Emirates,16th of February, 2017: INDEX Trading & Investment (ITI), a member of INDEX Holding, signed a MoU this Thursday with Smartmedical Corp., at the headquarters of INDEX Holding in the city of Dubai. The MoU was signed by Eng. 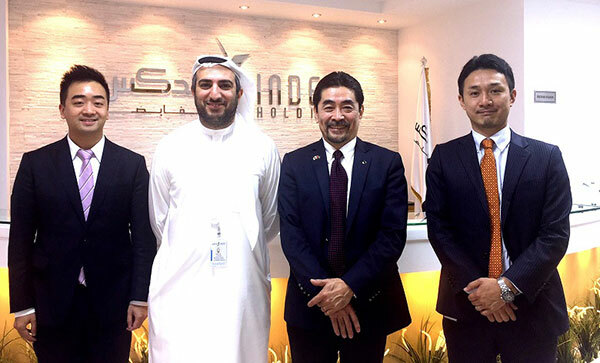 Anas Al Madani, Vice Chairman & Group CEO of INDEX Holding and Mr. Nozumu Shibasaki, CEO of Smartmedical Corp. This agreement allows INDEX Trading & Investment to license Smartmedical’s Emotion “Empath” in GCC countries, and to explore collaboration between the two companies on different areas of interest. The MoU defines the licensing alliance of Emotion AI technology “Empath”, Emotion Recognition Technology from Speech, named and developed by the ICT division of Smartmedical Corp. Empath can identify emotions in real-time regardless of language, by analyzing multiple physical properties of voice. Empath has been already adopted by several UAE’s government sectors. In October 2016, Empath was officially licensed to the United Arab Emirates’ national campaign, “Express Your Love for UAE” hosted by Aqdar (the Khalifa Empowerment Programme for Students) and sponsored by Lt. General H.H. Sheikh Saif bin Zayed Al Nahyan, Deputy Prime Minister and Minister of Interior. After the campaign, Smartmedical launched Android app “I love UAE” on December 2nd 2016 to celebrate UAE’s 45th anniversary of its founding. It is worth mentioning that recently the Japanese company has also signed a cooperation agreement with the UAE Ministry of Interior on the sidelines of the World Government Summit, 2017. Aiming to enhance cooperation between the two sides, the agreement will allow the ministry of interior to avail the applications and technologies presented by the Japanese company in the field of enhancing happiness and positivity.